Up until a couple of years ago, concrete was traditionally relegated to basements, garages, and sidewalks. It wasn’t typically thought of as a material to brought into residential homes, but recently, that all has changed. The concrete trend also referred to as the cement trend, is now a common fixture of Instagram feeds. In addition to providing a sturdy foundation, concrete is now being installed in homes as flooring, fixtures, and shelving. Polished concrete is characterized by its slick sheen. Sealed concrete has more of a matte look and has a sealant that protects against water and stains. Scored concrete has a grainy, textured finish. Designers and architects can provide a myriad of custom concrete options for homes. Although concrete may seem like a cold, flat material, it actually has this astounding way of creating a neutral backdrop for most any design style—farmhouse, Bohemian, industrial, minimalist, to name a few. It’s lower-maintenance than some materials, such as hardwood flooring, and mainly requires standard mopping and dusting. This beautiful cottage created by ALL & NXTHING is proof positive of this. The other notable thing about concrete is that it’s not limited to flooring and fixtures. Artisans have begun using the material to craft surprising decor pieces, from candlesticks to planters and even lamps. If you’re looking for a design element that’s unexpected, fresh and will stand the test of time, look no further than concrete. Here are 11 bloggers, builders, and designers who are doing it right. Concrete is a strong, stalwart material to use for a bathroom sink. Here, two sinks meet a countertop in a bathroom constructed by NS Builders. Its light color creates a soft, subtle palette for the bathroom while acting as an impactful design element in an otherwise minimalist space. In a modern farmhouse kitchen, concrete plays nicely alongside other design accents, like the navy blue cabinetry and sleek lighting seen in Lena Torres' kitchen You can include touches of concrete in your kitchen, starting with an island or the countertop, or if you truly want to commit to the trend, you can go top-to-bottom with flooring, countertops, an island, and even a backsplash. The grays will look terrific matched up with cabinetry in a bold hue. A bathtub rendered in concrete, like the one here in a bath designed by Kelle Contine, is sure to be a showstopper in your bathroom. Many homeowners love their concrete tubs for their luxurious quality and ability to provide a good, soaking bath. The installation is involved—they can weigh thousands of pounds and require a great deal of expertise to put in—but it will certainly be a timeless fixture that you can enjoy for years to come. Concrete has even made its way over to lighting, making up chic pendant lights and serving as lamp bases. Concrete lamps are plentiful on Etsy, or you can try your hand at making this lamp yourself—simply follow the DIY step-by-steps or accompanying video created by Cristina Ramirez of Flowers + Folk. 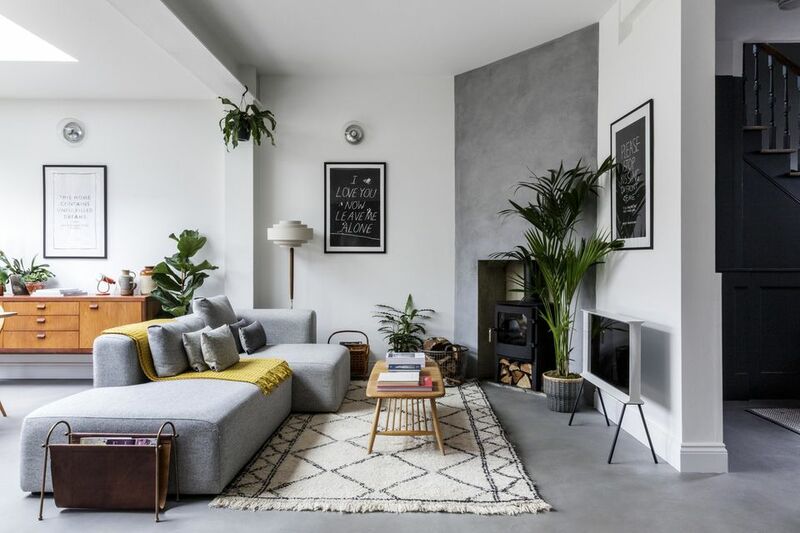 Instead of using traditional brick, stone or wood to construct a fireplace, why not go for a striking option and choose concrete instead, like Kenny Gemmill's fireplace? Here, a novel fireplace has been crafted using concrete that stretches all the way to the ceiling, completing the modern, yet rustic, styling in the living space. Concrete is undoubtedly a robust material to use for shelving. It can be depended upon to hold your heaviest keepsakes, and it has a note of innovative design as well. You can make your own open concrete shelving by following Leigh Anne Watts’ tutorial on her website, Houseologie. For a dining table that has an outside-the-box vibe, look to concrete. It offers a solid surface for family dinners, acts as a neutral stage for tabletop decor and can be handmade by concrete companies, artisans or custom-ordered online. Endemic Design crafted the stunning concrete table seen here. Borrow design inspiration from your garage and give concrete its time in the spotlight—in the flooring throughout your home, which is what Susanna Hawkins chose for her flooring. In this space, concrete flooring with a just-right level of sheen fades into the background alongside a boldly-patterned area rug, warm furniture, and pops of green houseplants. Concrete planters can be found almost anywhere these days, from Etsy to HomeGoods, and apart from looking perfectly on-trend, they also protect your plants, shielding fragile roots against windy and unfavorable conditions. Succulents are a great choice for concrete planters like these planters from SeaMint, but if you’re not ready to commit to a live plant, faux plants in concrete planters can be found easily. Concrete flooring might be considered a daring design choice, but to really turn heads, translate that concrete look to your walls. In Marja Wickman's dining room, lightly-colored concrete walls allow the homeowner to experiment with a variety of design options, including Scandinavian-style furniture and a contemporary pendant lamp. Votive holders are turning to stone these days, with your favorite scents poured into concrete vessels. You can even find candlesticks made of concrete. Here, in a vignette created by Chris Carroll, a concrete candlestick is impeccable on a coffee table, weaving in the grays of the couch and throw pillows. Many might believe that concrete isn’t a natural fit in most homes. But as it turns out, through a little ingenuity, concrete is a shockingly solid, classic and even beautiful accent to bring into today’s homes.